Cryptic definition, new spirit being alcohol, and not a psychological state! Cryptic definition: what's the full measure of the rise? Sort of cryptic definition? Not frightfully cryptic, really, unless you can see some sort of cryptic device that I can't ... just reads as a straight definition to me! Another cryptic definition, and firm is not a company! 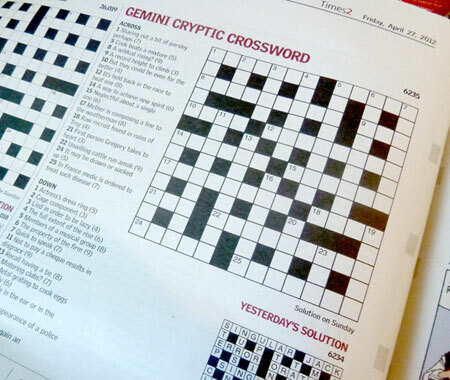 Starting this week, I will be explaining the clues from one Gemini or British Cryptic Crossword, as published in The Canberra Times, per week. I won't hold myself down to doing a set day every week, cos life and work can be a little chaotic at times, and the last thing I need is yet another deadline on a set day every week, and this is meant to be fun after all ;) But I will do my best to pick apart at least one cryptic a week. A little about the Gemini Cryptic. While there are two cryptics in The Canberra Times, the English Cryptic, and the Gemini, I'm pretty sure that both puzzles are English. From my sneaky interweb researches, I think it's produced by Gemini Crosswords, a UK puzzle syndication business. The British, and possibly the Gemini, Cryptics are also published in The Guardian newspaper. Their crosswords do tend towards what's called Libertarian, or non-Ximenean, clues. This obviously requires a bit of explanation. Ximenes was a cryptic setter from way back, and one of the many things he did was to set up the standards of fair play in cryptic crosswords. In 1966 he wrote the seminal book Ximenes on the Art of the Crossword (which resides on my bookshelf!). Basically, while a cryptic clue can deceive, of course, in the end it has to actually say what it means (in terms of the wordplay) and be fair to the solver. 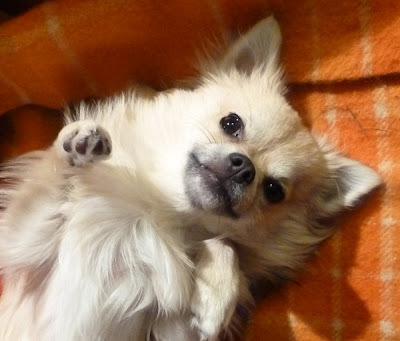 Clues that follow his standards are said to be Ximenean (and this is what I do my best to write). The Times cryptic is the bastion of a pure Ximenean cryptic crossword. There is a new camp, though, where these rules are seen more as guidelines, boundaries are stretched, and rules are broken ... these are said to be non-Ximenean or Libertarian clues. Many cryptic crosswords tend to have a smattering of Libertarian clues in them, some more than others, so it's good to have some idea of what Libertarian devices look like. I don't mind the first three of these examples, but do feel that indeed, finally, not, and exploits are pushing the limits of fairness to the solver. Libertarian clues can also be more wordy than Ximenean clues, with more linking words and even 'padding' to make the clue's surface meaning read better. This sort of padding is frowned upon in Ximenean circles. Some abbreviations are deemed to be Libertarian, such as note = A, B, C, D, E, F or G (as in the notes of the musical scale) ... while note = DO, DOH, RE, MI, FA, SO, SOH, LA, LAH, TI is Ximenean. I don't mind either, really. However, the word many in a Libertarian clue can abbreviate any combination of Roman numerals that adds up to a big number, so CL (150), MMI (2,001), CM (900), MD (1,500), and a large number of other possibilities (which I do think is unfair to the solver, as there are too many possibilities). Proper names may not have a capital letter, which may cause extra confusion when a famous person is being referred to. A clue may read as "put Word A into Word B", but in fact you have to put Word B into Word A. And so on ... so, in general, the rules are rather stretched and dodged at times. So, it's good to keep an eye out for these Libertarian devices when solving cryptics. I will do my best to point them out in the crosswords that I analyse here, so you can start to get a handle on them too! 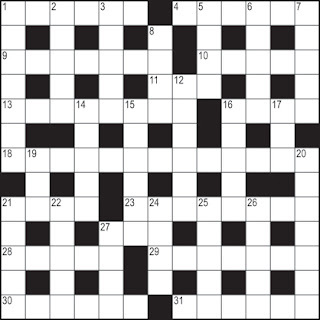 Tomorrow I will post a clue-by-clue breakdown of Gemini Cryptic Crossword # 6235, as published in The Canberra Times on Friday 27 April 2012. So, seeing as I'm even more au fait with cryptic crosswords now, than I was before, LOL, I'll start a little series of tutorials on this blog, and will post clues and explanations as I go. I'm also planning on doing a weekly analysis of The Gemini Cryptic Crossword, which is published in The Canberra Times, and many other places. SO. What ARE cryptic crosswords (apart from utterly infuriating?!). A cryptic crossword is a British invention, and as such tends to be more wide-spread and popular in the UK and Commonwealth countries (Australia, Canada, New Zealand, South Africa, India etc). There are a few American outlets for cryptics, but only a few. Note that this is a British style grid, not an American one (main difference is the pattern of and number of black squares, much higher in a British style grid, while in an American grid every single letter is crossed by both an across and a down word, and there are very few black squares). That's easy enough. They can still be hard, especially if the answers are rare words, and the definitions may sometimes be rather oblique, or examples of something, but you're generally just looking for a straight synonym to get the answer. In a cryptic clue, however, there are TWO ways of getting to the answer. Each clue is a little mini puzzle, with a variety of sorts of standard wordplay devices used. The wordplay is also called the subsidiary indication, or sometimes just the subsidiary, but I prefer wordplay, cos that says what it is more clearly. In this particular clue, betrayal is the definition, as in the 'straight' clue above. The wordplay section is unstable senator, and from is a linking word, joining the two halves of the clue (these are sometimes present in a clue, but not always). So, what about this unstable senator malarkey? Who is this perfidious senator, and why is he unstable?! Well, unstable is what's known as an anagram indicator — this is a word in the clue that tells you that an anagram is present, and you need to jumble up some of the letters in the word. And yes, you guessed it, senator is the word to jumble up (also known as the anagram fodder). And sure enough, when you jumble up the letters of senator, you get TREASON! Indicator words play an important part in many (but not all) cryptic clues. They are pointers to you as to what to actually do with the other words in the clue, and how to get to the answer. So there are anagram indicators, and hidden word indicators, and charade indicators, and ... you get the idea! There are about 8 or so types of common cryptic devices. Over the coming weeks I'll explain each one with examples, so you can really get the hang of them. I'll also post new clues, and see if I can get some interactive cryptic crosswords happening here too. What I love about cryptic clues is there's two ways to get to the answer, and it's very satisfying when you get both parts of the clue to equal the same thing! I've even learnt new words from solving cryptics ... I figure out the wordplay and think: "Huh, I think that's right, but is that even a word?" I look it up, and sure enough, there it is, with its definition, that matches the definition in the clue! Score! The writing of both books is DONE, thank heavens. All that remains now is to proofread and make final corrections on the second book (Cryptic Crosswords For Dummies), which mainly involves checking all 56 of the crosswords yet again. I will only get a week to do this in, the proofs will probably arrive tomorrow. 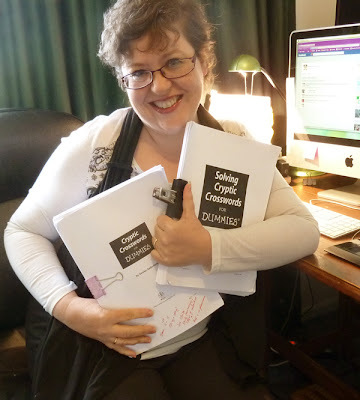 So, in 4 months I wrote two whole Dummies books, with around 2,500 cryptic clues between them. If there's ever a Volume 2 of the crosswords, I definitely want more time! I can handle writing one cryptic a day – it's intense, but do-able ... more than that is dreadfully exhausting (I've been averaging 1.5 crosswords a day for the past several months). 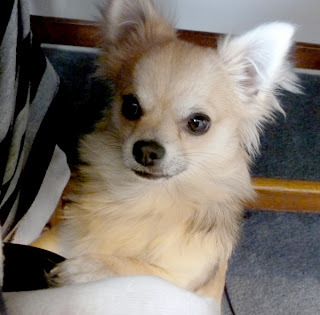 Griff is glad I can leave my desk sometimes, now!